Simply pan fry in 3 mins, once defrosted. High in protein. Caution! Although extra care has been taken to remove all shell, some may remain. Our King Prawns and Scallops with Lemon and Pink Peppercorn Butter are best pan fried. Defrost thoroughly before use, drain off any excess liquid before cooking. Ensure product is piping hot throughout before serving. 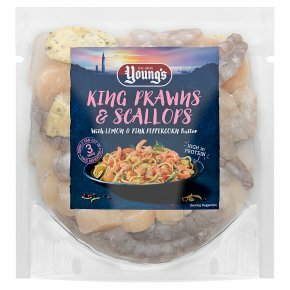 All appliances vary, these are guidelines only.3 Mins to Pan FryPre-heat a little oil in a frying pan over a medium heatRemove all packagingGently add the King Prawns, Scallops and lemon and pink peppercorn butters to the pan and cook for 3 minutes, stirring frequently.